The species is native to the Andaman Island, Arunachal Pradesh, Assam, Bangladesh, Bhutan, Borneo, China (Anhui, Chongqing, Fujian, Guangdong, Guanxi, Guizhou, Henan, Hong Komg, Hubei, Hunan, Jiangsu, Jiangxi, Kin-Men, Macao, Ma-tsu-Pai-chúan, Shangai, Sichuan, Tibet, Yunnan and Zhejiang), Darjeeling, Java, Laos, Nepal, Peninsular Malaysia, Sumatra, Taiwan, Thailand and Vietnam, where it grows in the thickets and along the banks of the water streams up to about 1500 m of altitude. The name of the genus is the combination of the Greek terms “κλῆρος” (cleros) = fate and “δένδρον” (dendron) = tree, name given by Johannes Burman (1707-1780), resumed by Linnaeus, to a plant which in Ceylonese was called “pinnacola” = unlucky; the name of the species is the Latin adjective “japonicus, a, um” = of Japan, with reference to the supposed place of origin. Common names: Japanese glory bower, red glory bower (English); cheng thong, he bao hua (Chinese); chirinto (Japanese); asara, kuthap angangba (Indian); patlange, igbo (Nepalese). The Clerodendrum japonicum (Thunb.) Sweet (1826) is a deciduous or semi-deciduous perennial shrub, erect, up to 3 m tall, with more or less pubescent branches having an almost quadrangular section. The leaves, on a 1-15 cm long petiole densely covered by short brown-yellowish down, are opposite, simple, cordate with pointed apex and toothed margins, 10-35 cm long and 6-25 cm broad, wrinkly above, dotted below by orange glands. Panicle inflorescences, terminal or at the axil of the upper leaves, on reddish, about 6 cm long peduncle, pyramidal, up to about 35 cm long, with reddish rachis and a crowd of hermaphroditic flowers, on an up to 2 cm long pedicel, with red campanulate calyx 1-1,5 cm long deeply incised in 5 ovate-lanceolate lobes, vivid red corolla, with 1,5-2 cm long tube and 5 oblong lobes of 1-1,5 cm of length, quadrilocular ovary and 4 curved stamina 4-7 cm long. The fruits are globose drupes with 4 lodges, of about 1 cm of diameter, blackish blue when ripe, with the lobes of the calyx persistent, containing 4 seeds (one per each lodge). It reproduces by seed, in sandy loam maintained humid at the temperature of 22-24 °C, which germinates in 4-10 weeks, and by cutting. Species diffused in nature in a vast area of South-East Asia, but relatively little utilized as ornamental in parks and gardens, cultivable in the tropical and subtropical climate regions and marginally in the temperate warm ones, where it can resist to exceptional drops of temperature just under the 0 °C, with possible damage to the aerial part. It requires a position in full sun and sheltered from the winds and is not particular about the soil, provided well drained, maintained almost constantly humid. It may be cultivated in pot for the decoration of particularly luminous greenhouses and winter gardens using a substratum rich of organic substance with addition of sand or agri-perlite for a 30%, with regular waterings in summer, more spaced in winter, leaving the loam to partially dry up before giving water again, and winter night lowest ones not under the 14 °C. The leaves are consumed locally as vegetable, leaves and roots are utilized in the Chinese traditional medicine for various pathologies. Synonyms: Volkameria japonica Thunb. (1784); Clerodendrum squamatum Vahl (1791); Volkameria kaempferi Jacq. (1794); Clerodendrum kaempferi (Jacq.) Siebold (1830); Volkameria dentata Roxb. (1832); Clerodendrum dentatum (Roxb.) Steud. (1840); Clerodendrum coccineum D.Dietr. 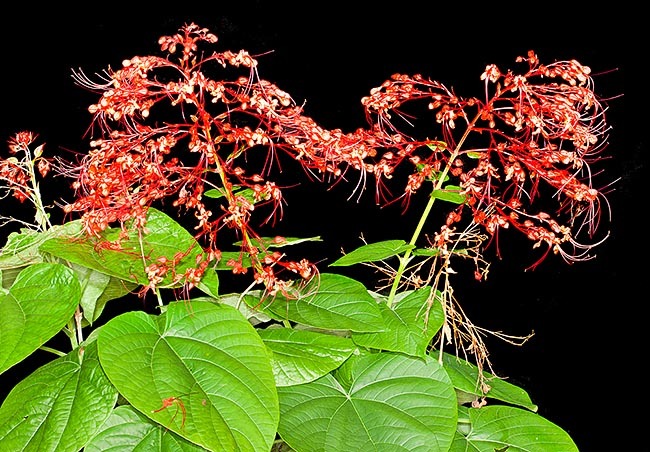 (1842); Clerodendrum kaempferi (Jacq.) Siebold ex Hassk. (1844); Volkameria coccinea (D.Dietr.) Schauer (1847); Clerodendrum imperialis Carrière (1874); Clerodendrum illustre N.E.Br. (1884); Clerodendrum darrisii H.Lév. (1912); Clerodendrum esquirolii H.Lév. (1912); Clerodendrum speciosum Teijsm. & Binn. ex Wigman (1912); Clerodendrum leveillei Fedde ex H.Lév. (1915); Clerodendrum coccineum H.J.Lam (1919). → To appreciate the biodiversity within the family LAMIACEAE please click here.